Hahaa! I bet you didn’t expect a technical post today! Well, I enjoy the element of surprise now and again. One of my newer readers, Eigen voiced a pretty common question about left hand technique: What is up with 1st finger in thumb position? It seems improbable that we should have to practically play on the nail to accomplish some of the chord shapes and dextrous scalar passages composers throw at us. But that is, by and large, exactly what we have to do. I am a huge proponent of playing in position. That means that the arm should put the hand in a place where the notes are readily accessible and the fingers fall over the notes. 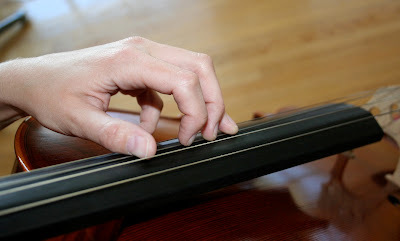 Many students, even those of an advanced level, hold their arm (and thus, their hand) at an angle such that each finger they put on the fingerboard requires some sort of movement in the arm and often, a rotation in the wrist. 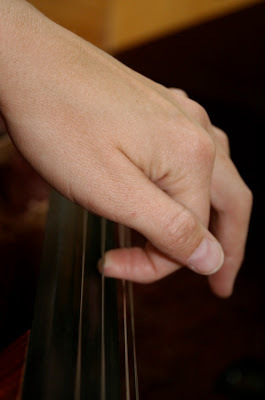 So the arm is in one place when playing 1st finger, and a very different place when playing 3rd in the same position. Not only does this equate to the musical version of pin the tail on the donkey, but it also creates a certain frenetic energy of sound, technique, and approach in general. I, of course, am very sensitive to that because I am a recovering maniac myself and suffered from a lot of unpredictable intonation as a student. Cathy Graff always instilled in me the “C” shape of the hand in this position. 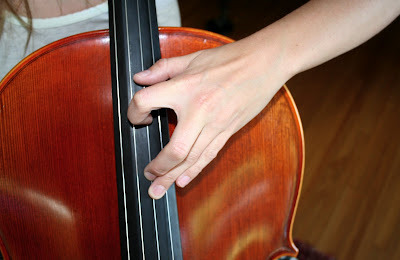 It is a strong shape, and it allows the fingers to drape over where the notes are located. Remember this about thumb position: if a piece asks us to play up there, it’s probably not the kind of piece where you can take a lot of time to readjust your position, nor will it reward you for using second rate technique to try and get around a difficult passage. Playing with clean technique may feel alien and take getting used to, but you know my thoughts: the long road is the short cut. Practice bockety technique for years and you’ll still have to come around to the more conventional shape eventually. Sure, it seems easier to mash your 1st finger down to precisely hit the note, but the by-product is that you push the rest of your fingers away from the notes they are expected to hit. Then you end up doing some sort of scandalous quasi-extension to hit a whole step, and you’re out of luck if the music asks you for something unholy like a major 3rd. Doing this also typically manifests a break in the wrist/hand line and a lot more tension than the curvier technique I suggest. It’s no good, all around. The first step on your way to better thumb technique is a slight paradigm shift. Vic Sazer talks all about playing on the side, or even the underside, of the string, and it is especially salient up here. All you need to do is stop the string, and the cello doesn’t care how that is accomplished. We are used to thinking about pressing down on the string, but pulling up works just as well. Since the notes are closer together up there, the extension is not so big. If it feels impossible to get from Bb to C# between 1 and 2, look to your shoulders and drop them. Then relax your jaw and legs. Then slowly come up to thumb position again, and make sure your thumb is not pulling backwards (towards your face) but rather is resting. sleeping. laying on the string. It should feel heavy and a little flexible. Then try again. Slowly is always the answer when it comes to practicing and adopting new technique. And remember, your intonation is bound to abandon you a little bit at first as you find your way. Be patient, and you will be rewarded by a technique that will be reliable, comfortable, and best of all, sustainable, no matter where you implement it. Thanks much. Do you have a favorite etude or exercise for working the transition from one hand shape to the other when moving back and forth, into and out of thumb position? Also, the “Then relax your jaw and legs” really made a lightbulb pop on over my head. I often forget to relax everything other than my arms and shoulders. GotGo: I don’t have an exercise that is pre-written. I tend to look at what my students are struggling with and write them a little “prescription” of notes that addresses those needs. That being said, there are nothing like double stops to keep a cellist honest. So maybe look at Haydn C major concerto’s first page, and practice that huge G scale into the double stop section near the bottom. Also, maybe practice the transition from 4th position into thumb by playing E with 1 and C on the D string with 4 and then, on the same bow, slide up to F# with thumb and D with 2. 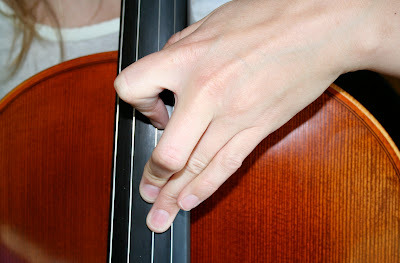 Stay in thumb and take a new bow, sliding back down to 4th position in the 2nd half of the bow. You can really watch your arm as you do this, too. Getting up and over the body of the cello takes practice, and it’s easy to assume extreme shapes that will them push your hand out of whack. When will that book come out? We really need it! Thanks so much. I think I am going to print out all relevant pieces of your blog meanwhile! The book, if all goes well, will be around come summertime. I have all of the content, but now that I have decided to offer it as a download, I need to clean up the formatting, etc. so it looks appealing. 85 pages is a lot to carry around, too (most of my practicing is in a parkling garage near my work), so I vote for splitting it up.